This wine comes from a selection of grapes from the oldest vines picked for their maturity and quality. This complex wine is made up of the best grapes from our old Callet vines. The wine remains in French and a few American oak barrels (80% new) for 12 months, followed by an indeterminate time in bottle until it becomes what can be described as “a fine wine”. 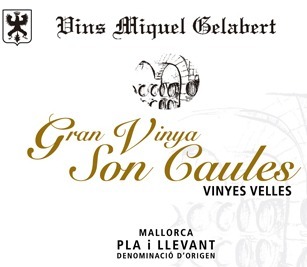 Grape variety: 90% Callet from old vines (58 years on average), 10% other varieties. Ageing: 12 months in French, American, and Caucasian oak barrels (new), followed by ageing in bottle. Tasting notes: Very intensely coloured wine with a cherry red hue and crimson rim. Complex aromas reminiscent of jams, wild fruits, especially blackberries, as well as coffee, cocoa, aromas of leather, toast and a mixture of spices. On the palate, the wine is silky and elegant, full bodied, round and well balanced with a long finish reminiscent of nuts and the warmth of the Mediterranean. Food pairing: pairs well with stews, casseroles of red meat made with wine, and matured cheese. – Silver Mezquita for the 2005 Vintage – “XVII Concurso Nacional de Vinos. Premios Mezquita. Córdoba 2010”. – Silver Medal for the 2005 Vintage – “Concurso de los Mejores Vinos Españoles para Asia”. Hong Kong 2010. – Silver Medal for the 2005 Vintage – “XI Salón Internacional del Vino de Madrid 2010”. – Silver Mezquita for the 2005 Vintage – “XVII Concurso Nacional de Vinos. Premios Mezquita. Córdoba 2011”.